Pastas and pizzas abound at this North End neighborhood favorite. 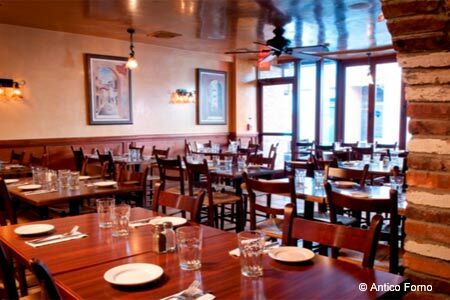 : The wood-burning oven is the focal point of this casual North End spot. Every dish, be it pizza, pasta or meat, is cooked in the beehive brick oven. Thin-crust crispy pizzas include the Napoletana topped with tangy plum tomato sauce, aromatic oregano and roasted garlic. Fusilli al tegamino, brick oven baked fusilli with sautéed eggplant, zucchini and roasted peppers topped with goat cheese and basil, is one of our favorite dishes. Smoky pastas with rich, soft cheeses like mascarpone and ricotta are equally memorable, while simple secondi such as pan-seared veal scaloppini and wood-grilled swordfish are standouts. Homemade cannolis and tiramisu top off the experience. Wines by the glass and sangría are available, and the signature cocktails are fun and fruity, including the lemonsecco and chocolate martini. While the quality here bespeaks upscale cuisine, the prices are more in line with casual red sauce fare, presenting a serious bang for your buck.